Hunting memories that will last a lifetime and beyond! 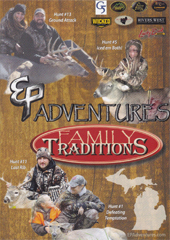 FREE Shipping on our DVD's & every online order comes with a FREE Slim Jim! It's about time! These good Ol' Michigan boys took a break from the Networks to bring you some of their funnest moments. As true Michigan natives, these guys and gals truly believe that the word trophy is in the eye of the beholder, and that's all that matters. So join us on this Adventure! Why? Because you're just like us! No B.S. 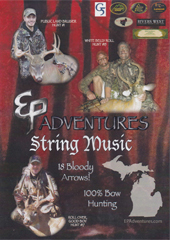 18 Bloody Arrows and less talk, more hunt action that will make you wanna pick up the bow and start flingn' Arrows. So pull the trigger on this one and let's get on the track together!! 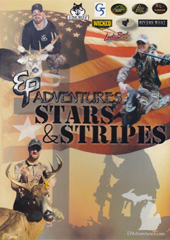 Welcome to EP Adventures, "Stars and Stripes." The EP Staff would like to thank all of the men and women of our armed forces this hunting season, and we are dedicating each hunt to them! There would be no hunting without freedom, and because of our entire armed forces we have the privilege to enjoy great hunting in this wonderful country. This video is dedicated to all who protect this nation, both foreign and domestic. God bless you all.